Navigation for Walkers is an easy to follow instruction book on how to fully understand and use maps, and the freedom this gives to navigate and complete any walk in the British countryside. Profusely illustrated in colour with 50 linked pairs of landscape photographs together with their exact map extract alongside. If you are at all apprehensive about taking the first steps exploring the countryside around you, then 'Navigation for Walkers' will certainly start you on the right path to aquiring the skills to navigate and complete any walk in Britain. 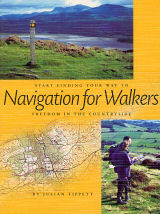 Only with a good understanding of maps and by using them correctly can any walker truly experience the quiet exhilaration and freedom of walking centuries old paths, bridle and green lanes which make up the thousands of miles of public rights of way that criss-cross Britain's uniquely beautiful and often remote open countryside. Based on the Ordnance Survey's new Explorer maps, as well as the Outdoor Leisure and Landranger series, this book takes the reader step by step through the essential techniques of map reading, navigation skills, reading the compass and route planning.